The State Department’s Counter Terrorism (CT) Bureau promoted on Friday a controversial Muslim scholar whose organization has reportedly backed Hamas and endorsed a fatwa authorizing the murder of U.S. soldiers in Iraq. The CT bureau on Friday tweeted out a link to the official website of Sheikh Abdallah Bin Bayyah, the vice president of the International Union of Muslim Scholars (IUMS), a controversial organization founded by a Muslim Brotherhood leader "who has called for the death of Jews and Americans and himself is banned from visiting the U.S.," according to Fox News. Bin Bayyah is reported to have been one of several clerics who endorsed a 2004 fatwa that endorsed resistance against Americans fighting in Iraq, PJ Media reported in 2013, when Bin Bayyah met with Obama’s National Security Council staff at the White House. The CT Bureau tweet linked to a press release on Bin Bayyah’s site condemning the kidnapping of hundreds of Nigerian girls by the Boko Haram group. 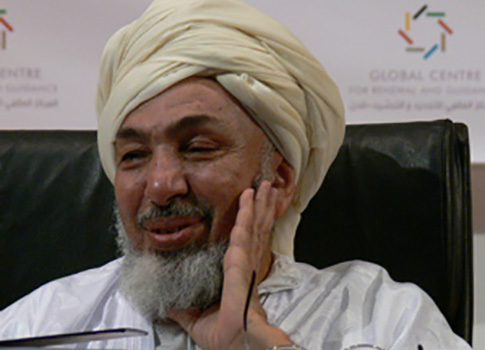 However, Bin Bayyah himself has been known to back controversial causes. Bin Bayyah has "urged the U.N. to criminalize blasphemy," according to reports, and spoke "out in favor of Hamas," the terror group that rules over the West Bank. The cleric also issued a fatwa in 2009 "barring ‘all forms of normalization’ with Israel," according to Fox. The 2004 fatwa on Iraq stated that "resisting occupation troops" is a "duty" for all Muslims, according to reports. Terrorism analyst Patrick Poole said that the State Department must more carefully choose the Muslim leaders it promotes. "This administration is continuing to push extremist clerics like Bin Bayyah as part of a fantasy foreign policy that somehow they are somehow a counter to al Qaeda," Poole said. "But in Bin Bayyah's case, it was his organization that issued the fatwa allowing for the killing of U.S. soldiers in Iraq and said it was a duty for Muslims all over the world to support the Iraqi ‘resistance’ against the United States that gave religious justification for al Qaeda's terrorism. "And [Bin Bayyah] said nothing as his pal Qaradawi issued fatwas authorizing the use of suicide bombings and publicly defended terrorist groups like Hamas, Hezbollah and Palestinian Islamic Jihad," Poole added. "If anything, clerics like Bin Bayyah and [Yusuf] Qaradawi have actively aided al Qaeda." The Obama administration came under fire in June 2013 for holding a meeting with Bin Bayyah at the White House. The cleric was confirmed to have met with members of Obama’s National Security Council at the White House to discuss poverty and global health efforts, according to multiple reports at the time. Yusuf Qaradawi, the Egyptian Muslim Brotherhood leader who founded the IUMS—where Bin Bayyah served as vice president—has been called a "theologian of terror" by the Anti-Defamation League (ADL). Bin Bayyah himself has advocated for the criminalization of "the denigration of religious symbols," which critics call an infringement on free speech. A State Department spokesman did not respond to a request for comment on the issue.